The Breathless Agony is a long and hard century. 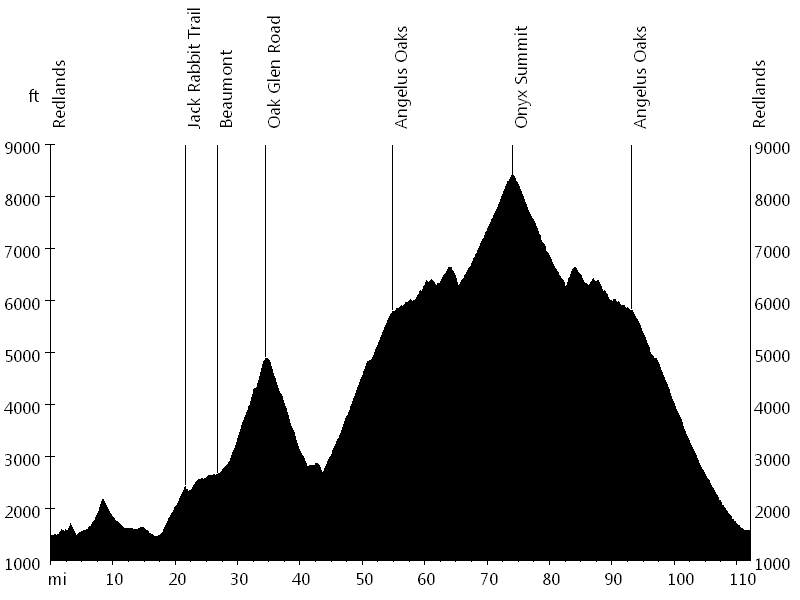 The route includes a dirt road, four passes, and a mountaintop finish at mile 75. The ride starts in Redlands and leads through a semi-rural area before climbing Jack Rabbit Trail (pass #1, dirt road). After visiting Beaumont, the route leads up Oak Glen Road (pass #2), followed by a descent to Mill Creek Ranger Station. Here the ride enters San Bernardino National Forest, climbing Mill Creek Road (pass #3), aka Damnation Alley. After visiting Angelus Oaks, Highway 38 continues to lead up to Onyx Summit (pass #4, 8,443 feet). From Onyx Summit it is 38 miles back to the start, most of it downhill. Some of the Renegades went for this ride, including Curtis C., John U., Mike G., Scott C., Tom Z., and myself. I ran into a few people I met at past rides, including Dave McR. from Pasadena and Jim M. and Don P. from San Diego. Some of the Renegades went for this ride, including Bob N., Curtis C., John U., Leon B., Tom Z., and myself.